Individual promotional sweets – create your own promotion gift for your customers. 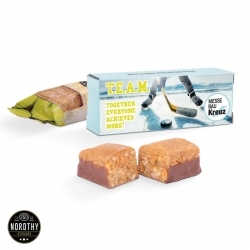 Fresh and fruity or a sweet surprise – our promotional sweets are multifaceted. 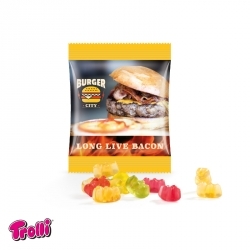 Convince your customer with promotional sweets that are individually printed with your logo. Surprise with delicious sweets and create trust with promotional candy. You can easily print your logo on different kinds of sweets, like chocolate or other candy. Start now and inspire your customers with personalized sweets. 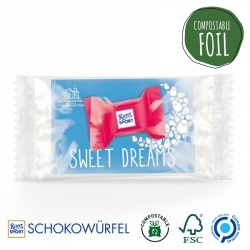 Savoury snacks in tetrahedron packaging with a white flavour-fresh foil. 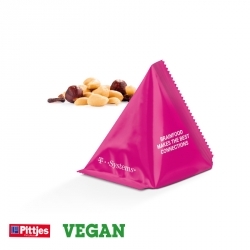 The innovative shape of the Snack Tetrahedron provides three advertising spaces for your own crunchy promotional messages. 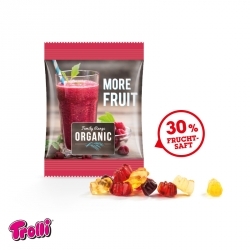 Fruity promotional greetings: The mini bag contains the colourful mixture of Exquisit Trolli jelly bears in fruit juice quality with 30 % fruit content. The white or transparent mini bag can be individually printed in accordance with customer wishes. This way, creative promotional messages are strengthened, and a lasting impression is left with the target group. Tear-open promotion: Here, the colourful jelly bears are found in five different Trolli flavours. Thrill your target group with the individually printed mini-bag in white or transparent foil. This way, fantasy and creativity know no limits. For all the globe-trotters and adventurers: Globe-shaped fruit jelly gums from the renowned brand Trolli make for the perfect eye-catcher at trade fairs, events or as small tokens of appreciation at points of sale. The airy foam-sugar globes are filled with a tasty sour fruit-flavoured core. 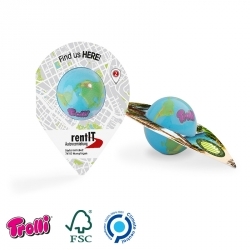 These globe-shaped fruit jelly gums packed in an individually printed advertising banderole in the form of a teardrop are especially popular as a giveaway item among travel companies, shipping companies and international companies. This promotional card makes for a striking presentation and offers universal applications for company advertising activities. The inside of the card contains a delicious HELLO Mini Stick from the renowned brand Lindt. The tear-off perforation on the folding card is practical and absolutely sensational. Whether used for coupons or rebate offers at the point of sale, this promotional card sets no limits on imagination and creativity. Piece by piece a fresh contact to your target group. Can made of white plastic with an original fastener in a full body sleeve that can be printed all round. 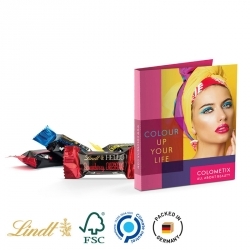 A giveaway with additional value: the advertising medium with Ritter SPORT chocolate cube can be individualised with a creative promotional message using the slip-in advertising card. The card found within also works perfectly as a coupon, invitation or business card. The giveaway is wrapped in compostable external foil. 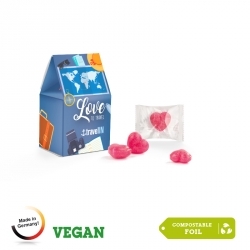 Particularly tasty, really warm-hearted: The attention-grabbing and individually printed packages contain six tasty heart sweets in a transparent and compostable flowpack. This way, the hearty greetings are cleverly conveyed to the target group and positive memories remain. This promotional card makes for a striking presentation and offers universal applications for company advertising activities. The inside of the card contains a refreshing Mentos chewing candy. The tear-open perforation on the folding card is practical and absolutely sensational. Whether used as original business cards or rebate offers at the point of sale, this promotional card sets no limits for imagination and creativity. Advertise sustainably! 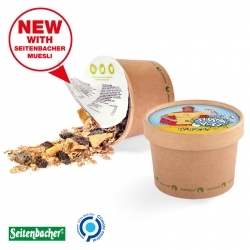 The cereal tub, made of fast-growing and self-renewable resources, can be customised as required thanks to its printable advertising insert. Thanks to a biodegradable bioplastic coating, the milk for the cereal can be poured directly into the biodegradable tub. Ideal for a delicious cereal meal to go! High-quality, compact and sweet - the square-shaped promotional box offers five advertising surfaces that can be individually designed and printed depending on the occasion. The inside of the box is filled with tasty Mini Cereal Bars from the Scandinavian brand Nordthy. 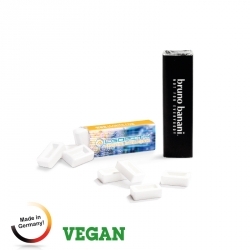 These Mini Cereal Bars are especially popular as an invigorating and energy-filled giveaway item for the areas of wellness, sports and health. Promotional giveaways - sweet, individual and a big surprise! Convince your customers with personalized and sweet promotion gifts, like chocolate or other kind of candy. Because edible promotional gifts and sweets, individually printed with your logo, will evoke positive emotions amongst your target group and create high brand recall results. See, smell, taste - each of our sweet giveaways wins people over with its own sensual moment. Fresh and fruity sweets - the individual, personalized gifts are a big surprise for your potential customers. This is advertising that not only finds its way to a customer's heart through the stomach, but also touches the heart and mind directly and creates a lot of sympathy. Promotional giveaways like sweet bonbons or fruity and fresh sweets in different designs- personalize it for your potential customers, because this is the best and most convincing form of advertising.